Unless you quit your job and move to a deserted island, stress will remain a part of your work life. It doesn’t matter what position you hold or the size of your bank account; if you work you will get stressed. It comes along with having responsibilities and tasks that need to be accomplished. The level of stress gets magnified when you factor in deadlines, competition, targets and unforeseen circumstances. Your body has its own defence system when you encounter a particularly stressful situation. It releases a hormone called cortisol which places your body in a heightened state of alertness. But cortisol does not stay in the body for long. Once the situation has passed the amount of cortisol gets dissipated. If you keep getting stressed, you will release more cortisol and create a catabolic environment in your body. When your body enters a catabolic state, muscle protein gets cannibalized, your testosterone levels drop and your immune system gets compromised. This is why people who are described as looking “stressed out” look haggard. Since stress is part of everyday work, trying to eliminate it will be an exercise in futility. A better approach would be to find ways to manage stress. When you’re stressed and working long hours, your body tends to tighten up because of poor posture, maintaining a positions for an extended period of time (for example a lot of people tend to clench their teeth when stressed) and lack of physical activity. These result in poor circulation in the body and can lead to migraines, headaches, mood swings, lower back and neck pain, painful wrist joints and stiff shoulders. Massage relieves stress by improving blood flow and circulation. Massage does this by using a variety of techniques on the soft tissues of the tensed areas. It doesn’t take more than 10 to 15 minutes of massage to loosen up tight muscles. A corporate massage program will help personnel overcome the physical hindrances of stress resulting in greater productivity and a happier workforce. When you want to improve your productivity, the last thing you would want is to waste time looking for documents and office supplies. By simply organizing your work place, you will be able to increase your level of productivity. A clean and well organized work place is also a more relaxing area to work in. You want to remain focused on the task at hand. Having so much clutter on your desk creates more distractions. Keeping your workplace clean also lowers the risk of getting an infection. A 2002 study from the University of Arizona revealed that a keyboard had more than 3,000 germs per square inch! So after cleaning your desk, you might want to run to the pharmacy and get a natural hand sanitizer to avoid getting all the infections going around in the office and ending on your keyboard. There is a very good reason why US President Barack Obama, Virgin Group founder Sir Richard Branson and media mogul Oprah Winfrey make time to plan their day. They want to avoid the guesswork and minimize the incidence of stress. Planning your day also improves productivity because you maximize available time. There are only 24 hours in day. Once you remove sleep, errands and daily routines, you may have eight hours or less left for work. If you are an entrepreneur, eight hours may not be enough time to get things done. If you plan your day properly, eight hours will be more than enough to accomplish everything you need to do. President Obama plans his day the night before; so you can do the same by creating a clear plan of attack and be able to fit more into your day. Simply put, if you don’t get quality sleep you will not be able to function well. Collectively, these conditions will affect performance at work and conversely increase stress. Overall, teas and other infusions taste good and can give you a better overall sense of well-being whilst maintaining you hydrated. Productivity is less about the amount of time you spend and more on the quality of work you render within a specific period. If you are stressed out, your ability to focus and come up with the best decision will be compromised. It is therefore crucial to take breaks and recharge your batteries. Go to a place where you can relax and spend it with people you can have a laugh with and who can give you positive reinforcement. On your return, you will be more productive and objective because your mind will be clearer. There are many studies that shows listening to calming music can greatly reduce the levels of stress. Many can attest to the positive effect of calming music. But what exactly qualifies as calming music? Everyone has different taste but a basic rule to follow is 60 beats per minute. According to research, 60 bpm best stimulates the brain to produce alpha brainwaves which are prevalent when we are at a relaxed state. Many people resort to comfort food such as pizza, burgers, french fries and ice cream during times of stress. In the short term, they make you feel good but once the satiety wears off, you will most likely feel worse than before. These popular comfort foods are very difficult to digest and wreak havoc in our various bodily systems. Eating sugary food increases blood sugar which will make you sluggish. Eat food that is rich in vitamins B, C, D and K. These vitamins help counter stress and support the immune system. Great example include: avocado, blueberries, almonds, oranges, salmon, spinach and oatmeal. Including a few of these in your lunch is a good strategy to help lower your stress levels. Exercise is one of the most effective ways to manage stress. Just like massage, exercise helps improve blood circulation. It also releases mood enhancing endorphins which make you feel good about yourself. It keeps you strong, confident and helps maintain your immune system. Thus it is no wonder that President Obama, Sir Richard Branson, Amazon.com CEO Jeff Bezos and Apple CEO Tim Cook always find time to exercise every day! 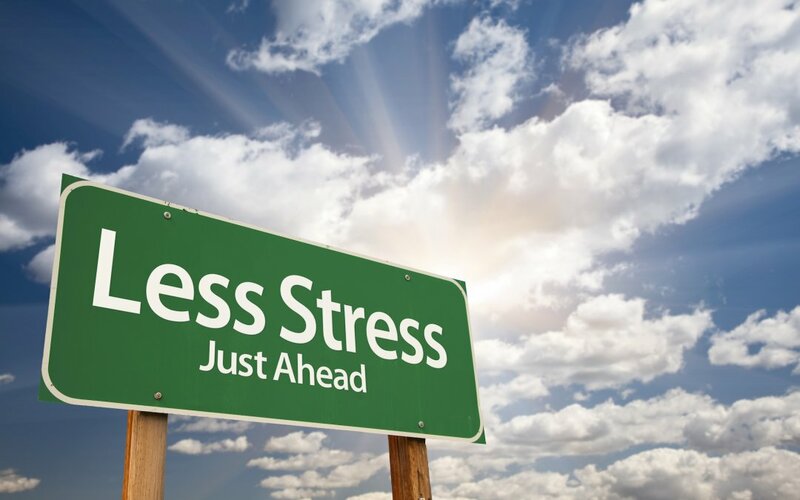 While stress comes with the territory at work, it doesn’t mean they cannot co-exist. What you need to do is to set conditions in your workplace and at home to ensure stress will never get the best of you.